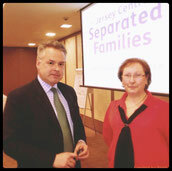 Welcome to the Jersey Centre for Separated Families, the community organisation that works with everyone affected by family separation in order to bring about better outcomes for children. Our Support Group Meetings are informal events and are held at 9 Burlington House, St Saviour's Road, St Helier and you are more than welcome to bring a friend for support, we look forward to seeing you all. For further information please call 07797-798192. Thanks to all the volunteers who attended the Safeguarding Partnership Board Safeguarding Children course to update their skills and knowledge today!